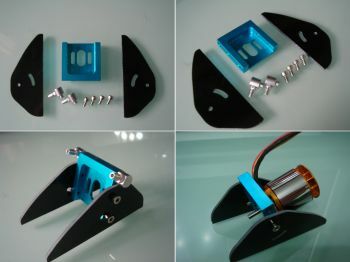 Etti adjustable motor mount for 380 inrunner or outrunner motors with 16mm motor screw spacing. Blue anodized center section with water cooling and black fiberglass stands. Motor screws. Mounting of the unit in the hull. And gluing of the water inlet and outlet in the desired position.